Below the ground in Florida lies a layer of porous limestone or dolostone known as the Floridan Aquifer. This aquifer is the primary source of Florida's drinking water. It is one of the largest aquifers in the United States, extending across Florida and through parts of Georgia, Alabama, and South Carolina. Above and below the aquifer are other layers of gravel, sand, clay, dolomite, or limestone. 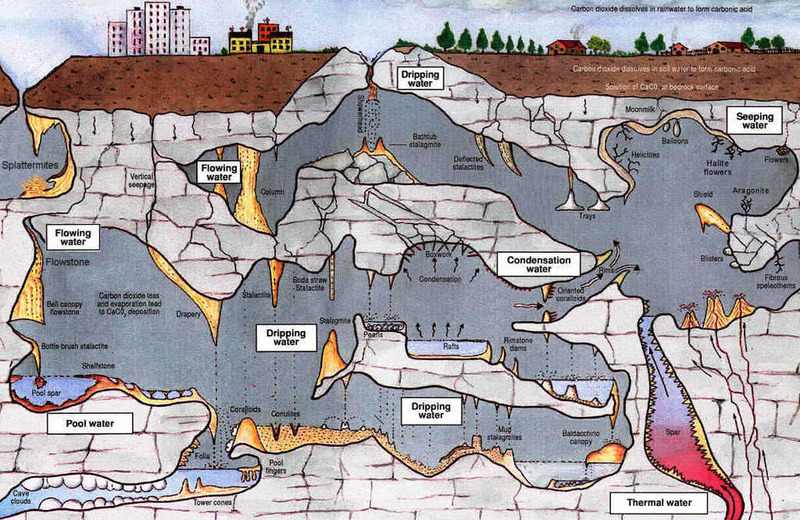 In some places, the Floridan Aquifer's limestone layers are thousands of feet thick; in others, the layers are thin. Some places these limestones are far below the ground surface, and some places they are the ground surface. Water is able to flow through the limestone's many interconnected holes and empty spaces. The result is a unique and complex terrain that scientists call "karst" topography – land whose shape is influenced by the dissolving of underground limestone layers. Where the water table (the groundwater/air interface underground) lies within this porous limestone, we have dry caves. Below the water table, we have cave diving. By definition, a cave is "an underground chamber, typically of natural origin, that can be entered by humans", so these chambers become our caves. But how exactly did they get here? 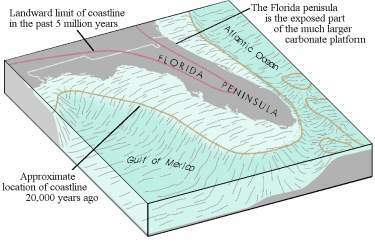 The Florida Peninsula is a limestone plateau formed many millions of years ago when the area was a warm, shallow sea. During the Cenozoic Era (65.5 million years ago [mya] – present), millions of years of deposits from small sea creatures make up the limestone, which is several thousand feet thick. Below that lies the Paleozoic and Mesozoic basement rocks (540 – 65.5 mya), consisting of igneous and metamorphic rocks overlain by sandstones and shales. These basement rocks are arched in a NNW-SSE alignment in the Florida Peninsular Arch, which peaks in Alachua County. During the Cenozoic Era, Florida slowly took its current shape, and warm, tropical oceans still covered the state until the Late Oligocene Epoch (28.4 – 23 mya). Limestone comprised of the skeletons of billions of small creatures called foraminifera accumulated, one formation being the Ocala Limestone. Large, voracious whales roamed our shallow seas hunting other marine vertebrates. Small patch reefs formed in the warm, clear, shallow waters of Florida. Also during this time period a marine current, very similar to the Gulf Stream, swept across northern Florida and scoured the sea floor. This current deflected sediment that was being eroded and transported from the mainland. This is the reason why limestones from this time period in Florida are so pure (up to 99% calcium carbonate). At the end of the Oligocene Epoch (23 mya), sea levels dropped and Florida emerged from the sea. 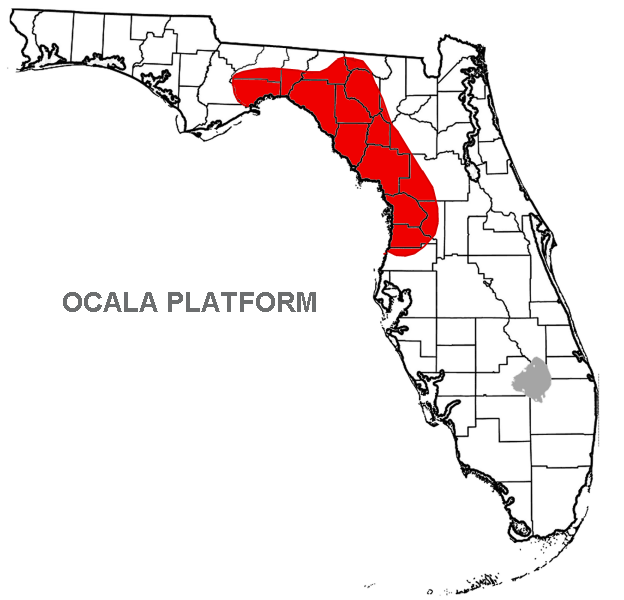 This period also saw the start of the "Ocala Uplift", or Ocala Platform, a northwest-trending structural high in west-central Florida, that exposed the cave-bearing units to vigorous erosion and cave forming forces. 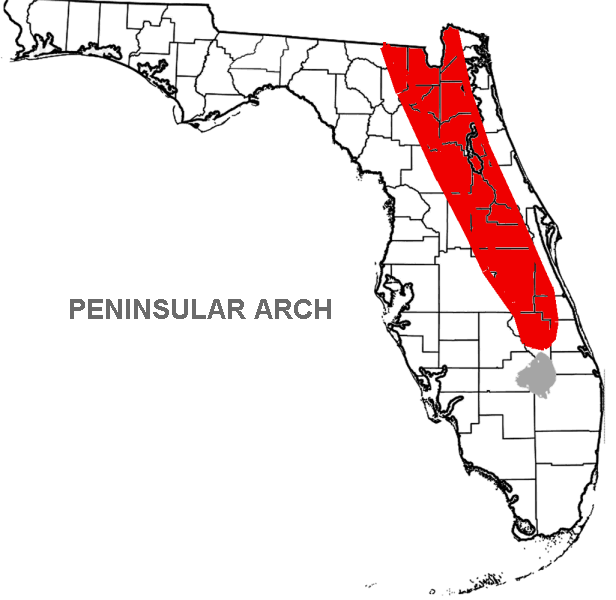 Florida Peninsular Arch and the Ocala Uplift also created tensional forces in the limestone that formed vertical joint sets in that rock. The first fossils of terrestrial vertebrates come from this time period and include animals like bats, horses and carnivores. From this point on at least some portion of Florida would remain above sea level. Throughout the end of the Oligocene and into the Miocene, sea levels fluctuated and clays and sands became common deposits (Hawthorn Group). In the Early Miocene, the Appalachians were uplifted, erosional rates increased, and continental siliciclastics began encroaching southward upon the carbonate depositing environments. These and later beach deposits are much of what caps our cave-bearing limestones. The Pleistocene Epoch (2.6 mya – 10,000 years ago), also known as the Ice Age, was a time of extreme climate and sea-level change. Sea levels were as much as 300 feet lower and as much as 100 feet higher than today, linked to the far away giant continental glaciers advancing and retreating. Lower sea levels led to rapid land and subterranean erosion and limestone dissolution, while higher sea levels allowed marine limestones to accumulate, and let many caves to become springs and underground conduits. Prominent surface features of this sea level flux are the relict beach dunes seen in the Keystone Heights area (east of cave country), and the escarpments of western Alachua and Marion counties and on around through the Florida Panhandle. The 100-foot Cody Escarpment is a major relict sea level scarp located in north and north central Florida. This prominent and ancient persistent topographical feature is the remains of early Pleistocene shorelines of (1.8 mya to 10,000 years ago) during interglacial periods. It divides the Gulf Coast Lowlands, with its thin layer of soil over limestone, to the west from the Northern Highlands plateaus of sand, clay and carbonate rock to the east. The Cody Scarp and the Gulf Coastal Lowlands are karst landscapes, with many sinkholes, springs, underground streams, and related features The Northern Highlands plateaus are caps over the limestone, disallowing access to cave-bearing limestones below except where breached by drilling, solution pipes, sinkholes, etc. The main cave-bearing unit in north central Florida is the Ocala Limestone, which is overlain by the Hawthorn Group in most places. The sands, clays, and other units of the Hawthorne are eroded off the Ocala in many areas, remaining as hilltops in parts of Alachua and Marion Counties. The Ocala Limestone formation (formerly the Ocala Group) consists of (in descending order) the Crystal River Formation, the Williston Formation, and the Inglis Formation, and ranges from 0 to 235 feet in thickness, averaging about 70 feet in the west central Florida area (technically these three “formations” should be “members” of the Ocala Limestone, but their designation as formations persist). It was deposited from a shallow sea onto the erosionally beveled surface (an unconformity) of earlier limestones, between ~55.8 to ~33.9 mya. This sea had its coastline in southern Alabama and Georgia, and was very biologically productive, thus leading to the highly fossiliferous nature of the Ocala. 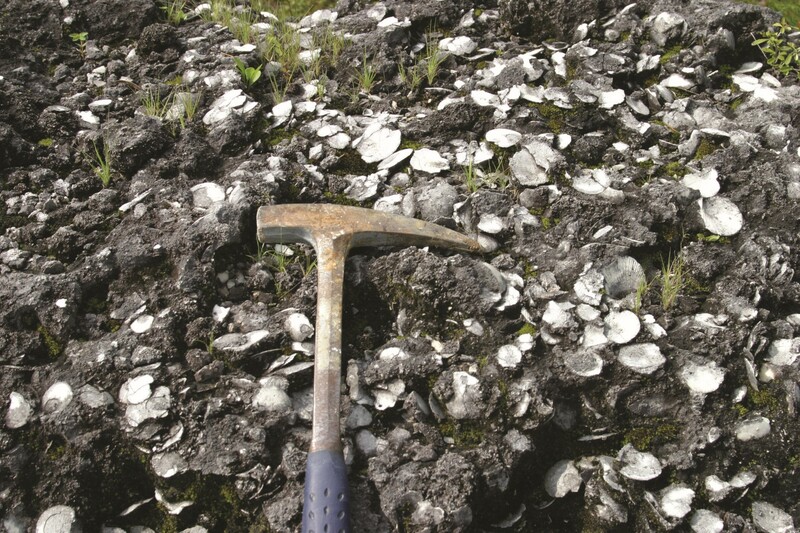 The middle-late Cenozoic Ocala Uplift kept most of the Ocala Limestone near the land surface in Alachua and Marion Counties for the last few million years. This limestone is soft, pure, creamy white, granular, and very porous. This pervious nature leads to ready dissolution by acidic groundwater, leading to the highly caved nature of the Ocala: it is riddled with chambers, passages, solution pipes, cracks, and voids. The surface features include the classic list of karst features: sinkholes, round lakes, broad, flat prairies, disappearing streams, springs, and caves. Its permeable and transmissive properties allow the Ocala to form a vital portion of the Floridan Aquifer. The Ocala is a very fossiliferous limestone, with the predominant fossil type being the Lepidocyclina foraminifera, popularly known as "forams". Portions of this rock unit are made up solely of piled up forams, and they look like nickel-sized potato chips. After forams in number come mollusks, seen mostly as scallops and oysters. A characteristic scallop of the Ocala is the Amusicum ocalanum, which has a round, thin, symmetrical shell, and can be found in heavily concentrated lenses throughout the Ocala. 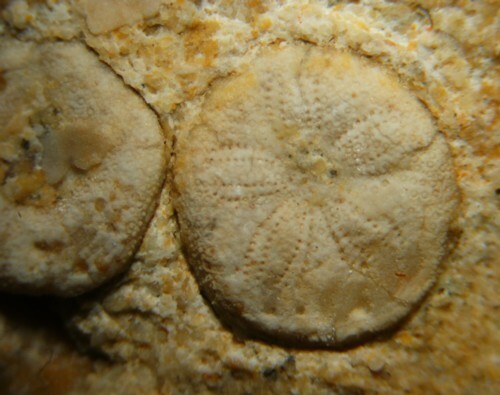 A third well represented fossil are the "echinoids", ancestors of modern sea urchins. They look like fat sand dollars, and come in many shapes and sizes in the Ocala. Other common fossils found in the limestone are crabs, snails, and the occasional vertebrate. CHERT! 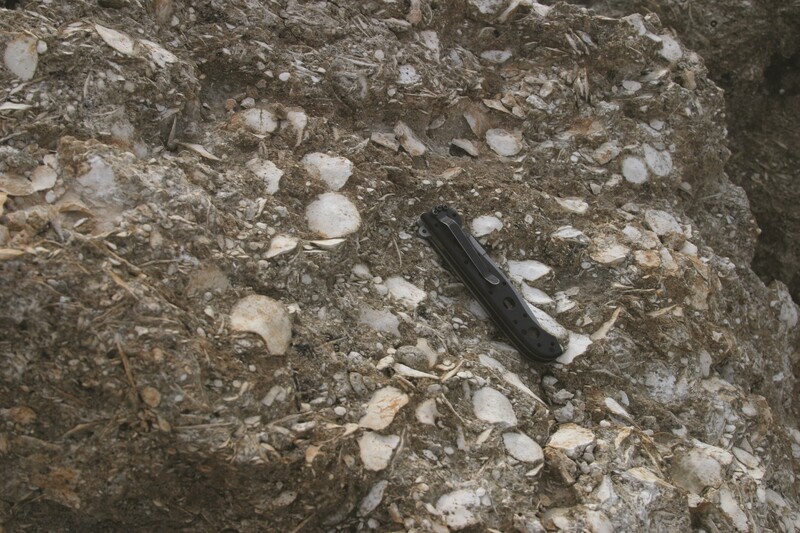 Also found in the Ocala are sheets, nodules, and blobs of chert. Chert is also known in Florida as flint or flint rock, is an extremely fine-grained variety of the mineral quartz. The material was formed by the replacement of calcium carbonate with silica carried in circulating ground water, making the chert a post-depositional modification of the limestone. Since it is a mineral replacement, much of the chert still contains traces of the fossils that were present in the original limestone. Chert was utilized by Florida's native populations in the manufacturing of axe heads, spear heads and arrow points. Overlying the Ocala Limestone is the Hawthorn Group, consisting of gray-green Fuller's earth (kitty litter clay), sandy clay, and gray, sandy phosphatic limestone. It does contain some fossil mollusks, and is not a good cave forming unit. It is discontinuous and found chiefly as remnants on hilltops west of Cody Scarp, and is a competent and continuous cap unit east of the Cody Scarp. In many cases, this is that nasty, sandy, clay you have to go through to get to the cave. There other pertinent rock formations that overly the Ocala Limestone, the two chief ones being the Tampa Limestone and the Suwannee Limetone. The Tampa is thin, ranging up to three feet thick, and is located southwestern flank of the Ocala Platform from Pasco County and southward in to Hillsborough and Sarasota County. It contains beautifully preserved mollusks and corals in molds and casts with silicified pseudomorphs and shell material. The Suwannee Limestone is sometimes found between the Ocala and the Hawthorne, and more to the north, at the eastern end of the Apalachicola Bay, in the Suwannee River area and westward. It can be a cave-bearing unit in the panhandle area. Solution caves occur in limestone and gypsum and are the main cave type in Florida, mostly in limestone. 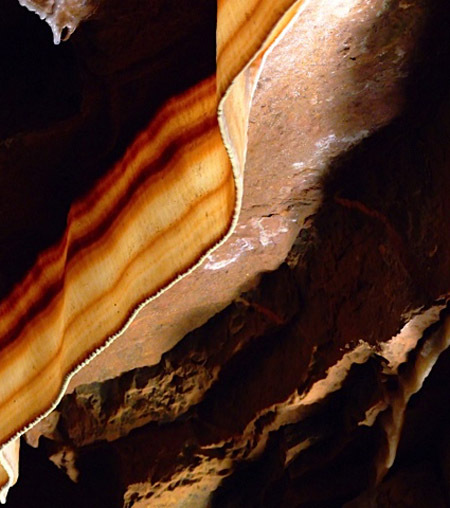 Although dissolution is the dominant process, other processes such as erosion and gravitational breakdown, or collapse, can contribute to cave development. Limestone, which underlies all of Florida, is able to be dissolved by slightly acidic water. Over geologic time (millions of years) large pore spaces, conduits and caverns can form as acidified rain and stream water percolate in. Calcite is soluble in a weak acid such as H2CO3 - carbonic acid. Thus, limestone which consists primarily of calcite (CaCO3) is vulnerable to chemical attack by groundwater. Carbonic acid can form by a reaction between water and carbon dioxide. As rainwater, already slightly acidic (pH~6), passes through the atmosphere and the soil layer, it mixes with carbon dioxide and forms carbonic acid. The acidic water passes through fractures, crevices, and cavities and dissolves the limestone very slowly, enlarging the network of passageways. As these underground voids enlarge, the land surface can collapse into these voids, forming sinkholes. Other karst features include springs, air caves and disappearing streams. On the other side of that chemical process is the deposition of CaCO3, leading to the beauty of cave formations. After the acidic groundwater passes through the limestone, it becomes saturated in CaCO3 along the way, and similarly it is somewhat "saturated" in the CO2 that made it acidic to begin with. When this saturated solution reaches a void, the water encounters an atmosphere "unsaturated" in the CO2, it degasses that CO2, becomes less acidic, and is no longer capable of carrying the CaCO3. 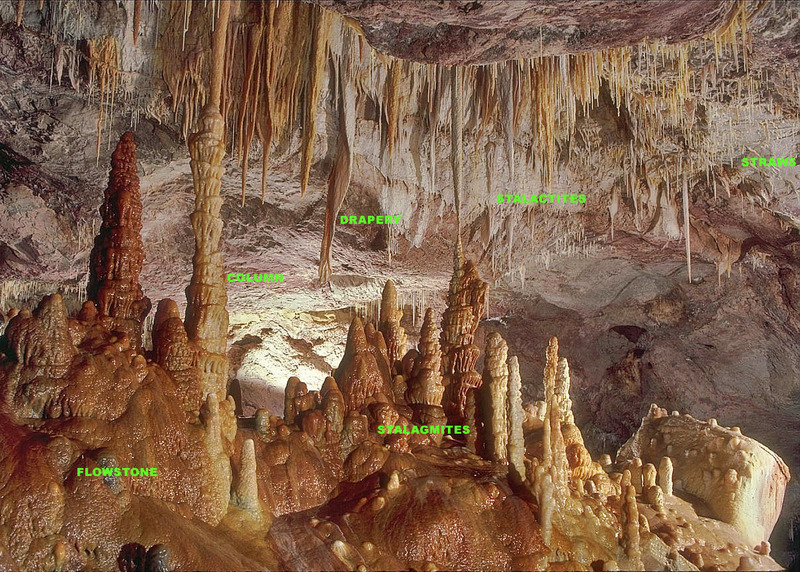 Therefore it precipitates the CaCO3 as stalactites, stalagmites, draperies, columns, flowstone, etc. If the groundwater were to pick up other minerals and elements along the way, these formations can acquire many colors. Most caverns are created at or just below the water table in the zone of saturation in limestone. If the water table is stable, large openings can be created because water would contact all surfaces of the cave, dissolving the limestone at a large scale. 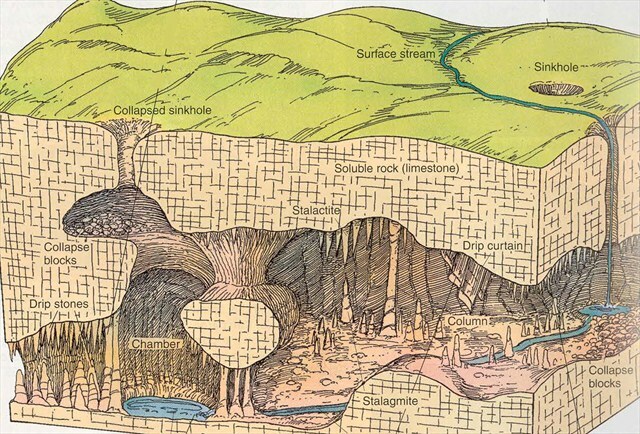 If the water table drops, the area of active cave formation will move lower into the bedrock and the upper openings are left in the zone of aeration, only subject to dissolution from running water. The dominance of limestone in the strata, along with structural and climatic conditions, give Florida the abundance of caves that we see today. These Cenozoic limestones rest on Florida's "Peninsular Arch" of Paleozoic and Mesozoic basement rocks (aligned roughly NW-SE), which in conjunction with the middle Cenozoic "Ocala Uplift", created set of joints in the limestone from the tensional stresses of these two elevated areas. The joints are in two sets, roughly aligned NW-SE and NE-SW, and create vertical planes of weakness that allow acidic water to erode and dissolve the limestone away. The horizontal bedding planes and unconformities (breaks in rock deposition) within the limestone create horizontal planes of weakness. When these multiple sets of weak planes combine, we get the complex cave structures we see today. Vadose or Phreatic? And When? Caves can either be underwater (phreatic) or above the groundwater (vadose), and usually most caves are both at some time, often in multiple occurrences. Phreatic cave passages have water flowing under pressure, so erosion takes place equally across the tube profile. In Florida, where the vertical joint pattern is strong, most phreatic passages are taller than wide. Vadose passages are air-filled and water runs freely along the floor of the passage, causing stream-type erosion, directed mainly downwards and form deep trenches or canyons. Since cave formation processes are different depending on phreatic or vadose settings, how a cave formed can be interpreted by several diagnostic cave features. Since any given cave can experience phreatic and vadose conditions in multiple occurrences, and at different levels and different chemical environments, interpretation can get tricky. 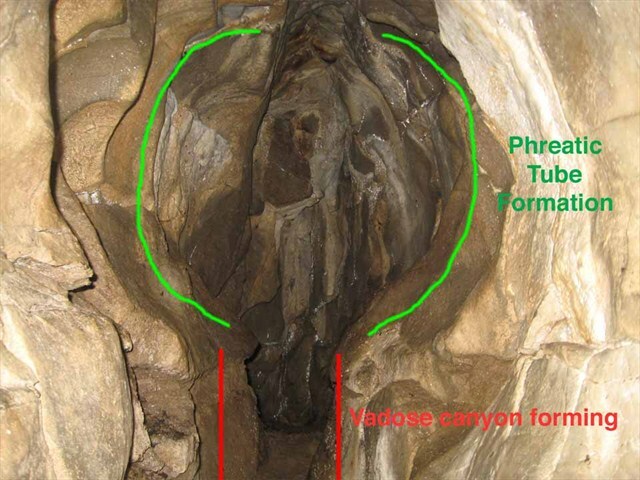 Here are some key features to look for to discern phreatic or vadose cave formation. Often, originally phreatic, tubular passages, are modified by vadose streams to create a keyhole cross-section. This is a very common type of passage, visible in many caves. 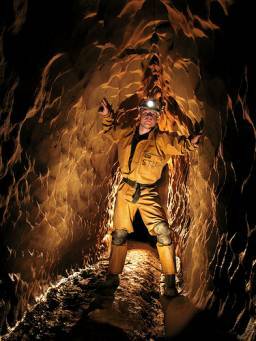 Any passage no longer conducting the water that formed it is described as a fossil passage. A lowering of the water table will leave phreatic passages either abandoned or subject to vadose flow, or turn your favorite spring into a walk-in cave. A rise in water levels can turn a vadose cave into a phreatic one, and often times a favorite cave was once a big spring complex. Fischer, Matt. "Geology of Marion County (with emphasis on cave-bearing units)." The Florida Speleologist 25.1 (1988): 31. Print.